In a railway siding, in a nowhere town in the middle of England, sits an engineering marvel, a vision of the future. Capable of travelling at 155mph, its current top speed is zero. The track it sits on is a dead-end. This is the Advanced Passenger Train. In the 1970s, the board of British Rail embarked on an experiment. They decided to fund the development of a new, tilting train: a train that could match the speed of new European services, even on Britain’s winding, Victorian railway infrastructure. A team was assembled. American aircraft engineers were drafted in. Hydraulic tilting mechanisms were created, new methods of harnessing power from the overhead lines were devised. Public money was spent. And by the late 70s, a prototype was ready for testing. The Advanced Passenger Train had arrived. The APT looks like it could have been designed yesterday, or today, or tomorrow. It’s breathtaking. The sharp yellow cab punctures the air. The name, forever futuristic, is written on the side, once, in large, clear letters, so that you could catch it as it screamed past. There are no extraneous elements to the design, livery, or title. No whizzes or bangs are necessary. This machine is Modernism incarnate, functional and simple. Built to go as fast as possible. And go fast it did. It broke the British speed record, clocking up a steady 150mph between London and Glasgow, leaning through the Lake District’s curves. Commemorative postcards were produced, heralding ‘The Most Advanced Passenger Train In The World.’ Souvenir bookmarks were printed. They proudly announced that the future is here: that the journey time from London to Glasgow has been cut to four hours, ten minutes. The APT had teething problems. The tilting mechanism was too effective, too smooth. Though the passengers could see the landscape outside tilting, inside there was no effect, leading to motion sickness (particularly among hungover journalists on demonstration runs). A nervous BR board pushed the train into service too soon, in the middle of the winter. A number of high-profile breakdowns, plus the full sick bags, led to the train being trounced by the press. And at the same time, a more conventional alternative, the slower, diesel-powered Intercity 125, was ready to go. In 1983, the programme was cancelled. The order for a full fleet was never made. The technology was sold to Fiat in Italy, who later used it to develop their Pendolino trains. Eventually, after British Rail had itself been broken up and privatized, the APT’s technology was sold back to the British railway passenger, via Richard Branson’s Virgin Trains, at a large profit for everyone (but the British railway passenger). 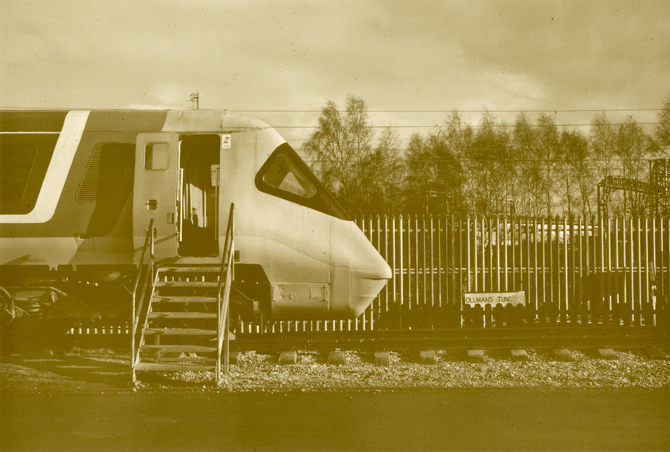 Today, the APT sits in a siding in Crewe Heritage Centre, hidden behind the car park of an enormous Tesco superstore. Taken care of, lovingly restored by a group of volunteers. Next to it, on the West Coast Mainline, newer trains slink past, avoiding eye contact. They belong to companies with sugary, commercial names like Virgin, or Arriva Western, or West Coast Super Quick, or Train-Go. They’re painted in garish, eye-catching colours, like Tango cans, or Barbie boxes, or iPhones, with meaningless dots and swirls and stripes to try to attract attention. Today, thirty years after the Advanced Passenger Train was shunted ignominiously into the sidings, the fastest of these trains, on vastly improved track, still only equals the APT’s time. Four hours and ten minutes. Tom James is a writer, self-publisher and civic activist, based in London. His work explores the structures, spaces and ideas that make up the built environment. His projects have been featured across the British press, with his fanzine, GO, voted one of Britain’s top art secrets in the Observer newspaper. He enjoys setting up fake institutions, and is currently working on a fanzine about the future, which won’t be much fun. Theo Simpson is a British photographer based in Sheffield, England. His work investigates the mechanics of the built environment, along with social, political and topical issues, with intent on further examining our everyday experiences and surroundings. Simpson’s work has been published internationally, most recently The New York Times T magazine and Photoworks.